Why is knowledge not infinitely valuable? This is a question I was asked a while back by someone challenging stories of KM value. "If Shell could deliver $200m per year through KM" he asked - "why not spend twice as much on KM and deliver $400 million?" The answer is that there is no linear relationship between KM spend and value delivery, because KM delivers value through removing inefficiencies. 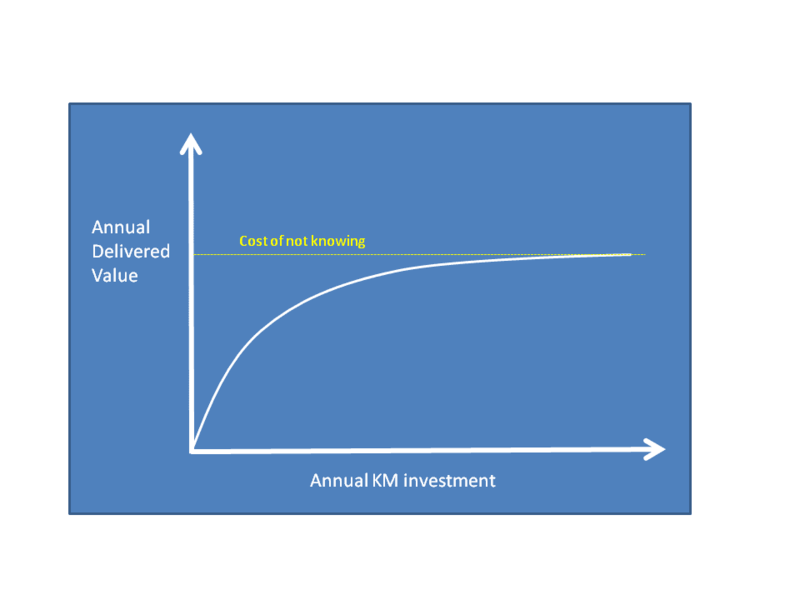 Specifically the value of KM comes through reducing "the cost of not-knowing", which is a finite quantity for any organisation. The cost of not knowing is a finite number, and is the difference between the current cost of operations and the cost of operations assuming everyone had access to the best knowledge. Defining or estimating your own "cost of not knowing" is an important step for any organisation, and most companies are surprised by how large this cost is, and how much value KM can deliver. Expenditure in KM can never release more value than the cost of not knowing, and the cost of not knowing can probably never be fully eliminated, as shown in the picture here. More and more KM spend will get you closer and closer to eliminating this cost, but I suspect you never remove it completely. Instead the ROI of your KM investment would reduce, until it fell below your organisation's investment threshold. Shell's $5m investment in KM reduces the cost of not knowing by $200m, which I suspect is a substantial proportion of that cost. They would not add another $200m by spending another $5m, and it may be that their $5m spend is the optimal balance.